28" circumference and 9" high. Finished Size 28” circumference and 9” high. Yarn Manos del Uruguay Maxima (100% extrafine merino; 219 yd 200 m/3 1/2 oz 100 g): #M2540 kohl (gray, A) and #M2110 zinnia (red, B), 1 skein each. Yarn distributed by Fairmount Fibers. Needles Size 6 (4 mm): 24” circular (cir). Adjust needle size if necessary to obtain the correct gauge. Notions Marker (m); tapestry needle. Gauge 30 st-pairs and 25 rnds = 4” in double knitting patt. 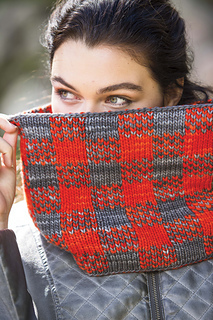 The Trapper Cowl, in the classic “lumberjack check,” was inspired by flannel shirts and jackets. A singles wool gives the cowl that same combination of sturdiness and softness, and it’s well-suited to double knitting. 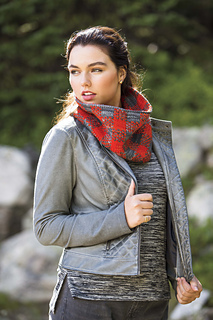 The result is extra-warm—and reversible.